DALLAS, TX--(Marketwire - March 9, 2011) - Pizza Patrón, the nation's number one Latin pizza brand, announced today that it will make its most successful limited time offering item, the Spinach Clásico, a permanent part of its menu. "We have served our Spinach Clásico as an LTO before during Cuaresma (Lent), and it was the most successful LTO in our company history," said Andrew Gamm, brand director for Pizza Patrón. "We brought it back for Cuaresma again this year and have already decided to add it to our menu permanently because customers love it." Pizza Patrón's Spinach Clásico pizza is a fresh spinach and mozzarella recipe that features a creamy Alfredo sauce base spread generously on a fresh, hand-crafted dough shell. 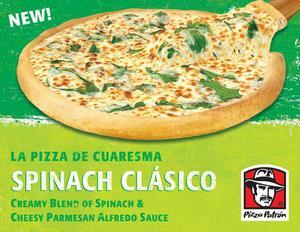 The Spinach Clásico is available at all Pizza Patrón locations for $6 for a medium and only $8 for an extra large, family-sized pizza. "We are concentrating today more than ever on bringing more innovation to our system. Our customers are asking for more variety and we will be introducing new unique Latin flavors in many of our upcoming LTOs," said Gamm. Recently highlighted in the Wall Street Journal for its strategic shifts focused on the Latino demographic, Pizza Patrón continues to be a lightning rod for discussion regarding Hispanics in the U.S. The company plans to continue to shape the brand to reflect the contemporary Latin experience in the U.S. today.